The next night (Dec 2), we had a performance in a jazz quintet setting for the Esquire and Tods Christmas party. Sasha was arriving that night from New York and scheduled to play with us (we were to hit at a little after 8:00 p.m.). 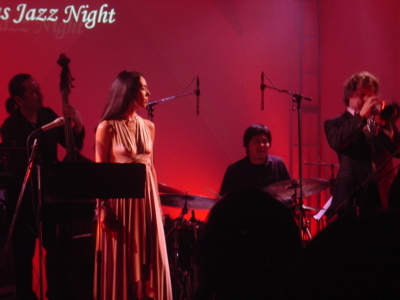 The musicians were Kaleb James who I had performed with in the past while still living in Japan (piano), Masa (of course! ), and Ikeda-san on bass who was introduced to us by Masa -- he regularly plays with Sleepwalker. We rehearsed without Sasha to get the songs down. I was requested to do a couple of jazz standards (we chose "Round Midnight" and "Night and Day"), a couple Christmas songs ("The Christmas Song" and "White Christmas), and a couple of my own originals ("Stop and Listen" and "Mysteries of Life"). Aside from my own songs and "Round Midnight," which I'd performed with my mother earlier in February, I didn't really know the other tunes so well and frankly was uncomfortable with the idea of doing covers. Masa tried to bring some fresh and funky beats to the arrangements, and during our sound check we did a pretty cool version of "Night and Day" -- it just came out -- but somehow it didn't go as well for the actual gig. I was at a loss for words and avoided MCing as much as possible, but Nyoro later reminded me of some stuff I was supposed to say. Such as the fact that I was wearing Tods sandals that they had lent me specifically for the gig. And the fact that I was half Japanese and Italian (Tods is an Italian company). Oops. MCing is always so uncomfortable for me. Sasha sounded great but was obviously very tired and in a slightly bad mood, which for me is such a drag to deal with. He too was uncomfortable with the gig and doing these standards. I realized too late that I have to find fresh twists when doing standards, otherwise I'm in danger of falling into the trap of a loung act, which is far from what I want to do or represent. The performance the following day went well. It was awesome hearing and experiencing live the noh performers for "Kogun" and "Children of the Temple," as well as with the big tako in "Universal Drums." Later at the after concert party in the ANA Hotel, I was able to see many of mama's old friends, acquaintances and supporters, as well as several of our relatives. The spread was really nice, but every time I'd attempt to drink or eat something, someone would come to get a picture taken together, so I went back to the room hungry.